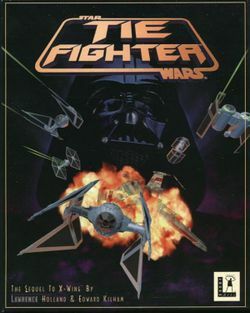 Star Wars: TIE Fighter is the 1994 sequel to the previous year's X-Wing flight simulation, taking that game's original mechanics and improving on almost every aspect of them. This time you play the part of a pilot in the Imperial Navy, marking the first time a Star Wars game has put you in the role of the bad guys. While the game engine was based on that of the original X-Wing, it boasts enhanced graphics with Gouraud shading, interactive mission briefings, goal-oriented missions (including secret bonuses) and pilot dialogue while in flight which furthers the story as you play. The game was released later as a Collector's CD-ROM edition which included full voice acting for all the dialogue and higher resolution graphics. It was re-released again for Windows systems and ran on the X-Wing Vs. TIE Fighter game engine which had a complete graphics overhaul. Imperial power... The Death Star! now scattered to the Outer Rim. and order to the galaxy! Beginning as a rookie pilot in training, you advance your way through the ranks and play through missions against the Rebel scum amidst a story of intrigue and corruption within the Empire. This page was last edited on 8 May 2018, at 19:21.